House Minority Leader Nancy Pelosi has promised everything she can for the young illegal aliens and her increasingly restive left-leaning caucus. The House members are grousing privately about how their leader is ruining their brand across the country. As for the illegal aliens and their activist enablers, they overwhelmed one of her press conferences in San Francisco. They badgered her US Senate colleagues, including Chuck Schumer by protesting outside of his home in New York State. Two weeks ago, Pelosi stood for 8 hours to demand that a clean DREAM Act be attached to the latest budget-spending bill. Meanwhile, since 2016 the Democratic Party has moved further left than anyone would have anticipated.They will embrace every letter in the LGBTQAI etc. list, they want to repeal the Second Amendment, abolish the First, get rid of the United States Constitution. They pretty much want to resurrect Karl Marx and Vladimir Lenin and have them both run for President/Vice-President in 2020. Unless they can get Che Guevara and Mao Ze-Dong for diversity’s sake, then they will go for that tag team. Dan Lipinski, a pro-life Democratic Congressman from Illinois, has not gotten an endorsement from the National Party. He also faces a stiff primary challenge from the Left. Republicans might have another pick-up opportunity in Illinois. Last year’s California Democratic Party convention was a hate-fest of corruption charges and curse words. Retired chairman John Burton resorted to repeated F-bombs and middle fingers. The election for next California Democratic Party chairman came down to a 60-vote margin between progressive populist outsider Kimberly Ellis and corporate establishmentarian Eric Bauman. Bauman won the battle, but the war for the California Democratic Party’s heart and soul has only deepened. Bernie-crats are crying foul louder than ever. Their precious push for single-payer healthcare, full-on sanctuary state status is running smack-dab into big business interests and lobbying firms who play both sides of the aisle for wealth. The only thing that unifies California Democrats right now is their vicious hatred of Trump, and even on that point they are disagreeing! To impeach or not impeach? Should they invest efforts to secede from the union? How about breaking up the state of California? The 2018 California Democratic Party convention was deeply chaotic, as well, opening in San Diego with multiple candidates contesting, vying for the much-coveted Democratic Party endorsements for different offices. The first major shock: US Senator Dianne Feinstein, the Grande Dame of California liberal politics, not only failed to capture the party delegation’s support, but actually lost to State Senate President Pro Tem Kevin De Leon, and neither one of them hit the 60% threshold, which means no endorsement. De Leon needed the party nod more than Feinstein. Still, her woman card and length of experience, plus hatred of firearms, couldn’t push her over the top. This is disturbing. DiFi is not left wing enough! Scary thought. The other contested statewide races offered shocking results (and refreshing hope for Republicans) going forward. Incumbent Attorney General Xavier Becerra is facing termed-out insurance commissioner Dave Jones. He received more delegate support than Becerra, yet neither one got the endorsement, either. Incredible. The anti-establishment strain in the California Democratic Party is flexing muscle, much to its own hurt. The delegates’ vote for Governor was even more intriguing, showing an incredible four-way divide. 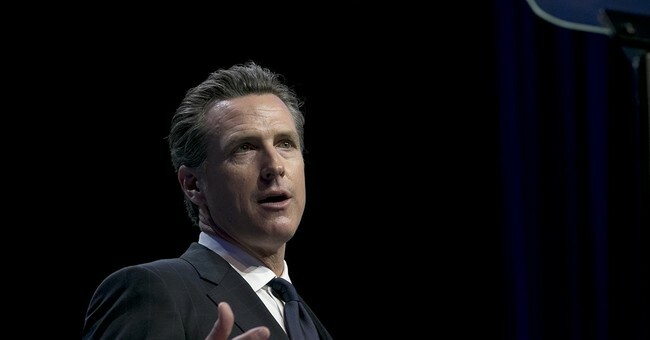 Lieutenant Governor Gavin Newsom won the most delegates at 39%, followed by State Treasurer John Chiang with 30%, former Superintendent of Schools Delaine Eastin with 20%, and then finally former LA Mayor Antonio Villaraigosa with 9%. Tony Villar was scraping the bottom of the barrel, most likely because he has tried the hardest to hue a consistent, more centrist message, much as Loretta Sanchez attempted in the US Senate race against Kamala Harris. It’s not working with Democratic operatives, however. In fact, this stifling of the official party endorsement happened for all contested statewide races and a number of Congressional seats targeted by the Democratic Congressional Campaign Committee. The Democratic path to retaking the House runs through California’s Central Valley and Southern California region. Most of the targeted House Seats are in Southern California, and some of the Republican incumbents (Royce, Issa) have announced their retirements, mostly from a combination of term limits as committee chairmen as well as increasingly menacing odds from Democratic challenges targeting their seats. There are so many Democrats jumping in, however, that liberal operatives fear that two Republicans could slide into the Top Two, denying Democrats their coveted chances at a House majority. Delegates could not unify and grant a 60% delegate threshold for one candidate running in those seats. It will be certainly interesting to see what happens June 5th, 2018. All eyes are on California, that’s for sure. A continued determination of progressive-leftist Democratic dominance will signal more divisive politicking between the Left Coast and the White House. If Republicans manage to push statewide contenders into the general election contest, and then hold onto key House Seats, then Democratic hopes of stifling the President’s agenda will hit another wall, and we can expect not just a resurgence of MAGA energy across the country, but a massive realignment of national party politics, with the Democratic Party turning into a defunct, regionalized rump of its former self.